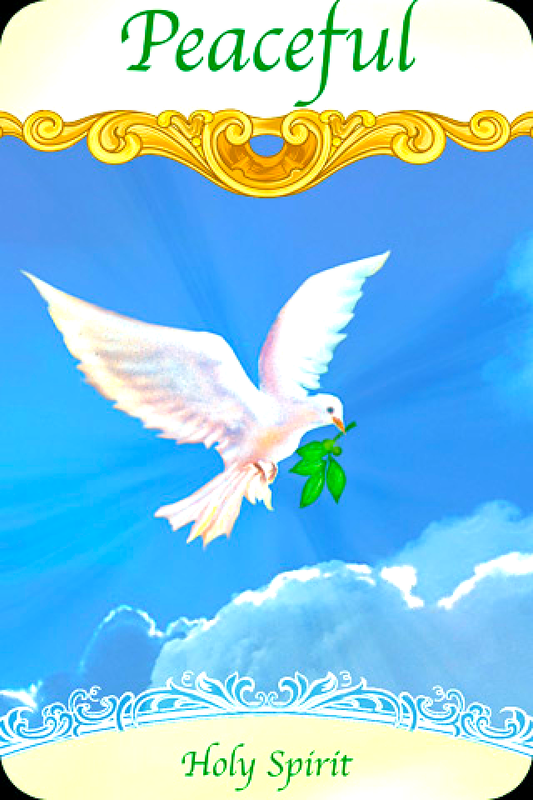 Peaceful ~ Holy Spirit: “The Holy Spirit has descended upon you and the situation that you are inquiring about. Get in touch with this Divine energy by focusing upon the peace that is deep within your heart. This serenity is like the gemstone at the core of a boulder, and you may have to dig deep within yourself to find it. This might require that you spend some quiet time alone in stillness. Rest assured that the Holy Spirit’s peace is pervading this situations and opening the hearts of everyone involved. It brings about compassion so that everyone can see each other’s point of view. This engenders forgiveness, which then opens and smooths the path to peacefulness. What if our only desire was to create peace and joy? What would that look like? How would it change the holiday season and all the expectations that come with it? What if we all suddenly realized that peace comes from the inside, not the outside… which seems to be the hardest concept for us humans to comprehend. Peace and joy. If we had peace and joy how would that feel? So how do we get it? Or do we already have it? Maybe we are blessed with infinite peace and joy, but we just can’t see it. Maybe it is within us, like a tiny pilot light, just waiting to blaze into life. Is that why we can feel it sometimes, but can’t seem to figure out how to make it stay? Do you ever have a wave of ecstatic happiness flood over you for absolutely no reason? How do you react when this happens? Do you embrace it with gratitude and joy? Or does ego kick in and tell you that you really have nothing to be happy about, and that if you are “too” happy, it could all be taken away? Do you try to moderate this feeling if it has no justification? Or do you look around you and think that it must be someone or something outside you which caused it to occur? This can be your higher self sending you a download of love and light. It is a feeling that you can cultivate with intention and commitment; pulling the bliss to you and through you from the abundance of Divine Love energy of the Universe. Take some time to sit in stillness and focus your attention inwards. Breathe deeply and slowly. Focus in on your little flame of love, peace and joy, found at your heart chakra. Visualize directing your breath into your heart center and gently blowing life into this flame. Watch it grow stronger and expand, radiating out and filling you with feelings of peace, joy, happiness, security and love. See this flame continue to grow until it surrounds you, the top of the flame reaching up through your crown chakra at the top of your head into the Universe. Then see it blaze down through the soles of your feet into the Earth. All of your chakras are charged with the bright light from the flame. Know that with this flame you can burn away fear, doubt, anger, trauma and pain. Breathe in the absolute knowing that you are at one with the Universe. And then you realize, you always were.